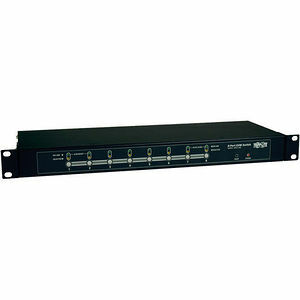 Tripp Lite's 8-port KVM Switch is the optimal solution for controlling up to 8 computers from one keyboard, mouse and monitor. Multiple KVM switches can be cascaded together in order to control up to 512 computers. Easily switch ports using the On Screen Display (OSD), keyboard hot key commands, or push buttons. Also supports ultra-high 180MHz video resolutions up to 1920 x 1440 pixels without noticeable degradation. Innovative design adjusts to either rackmount or stacking installation... rackmount hardware included. Compatible with all major operating systems except Mac and Sun. Constructed of heavy-duty steel housing. 3 year limited warranty. Interlocking Feet (for Non-Rackmount Applications).